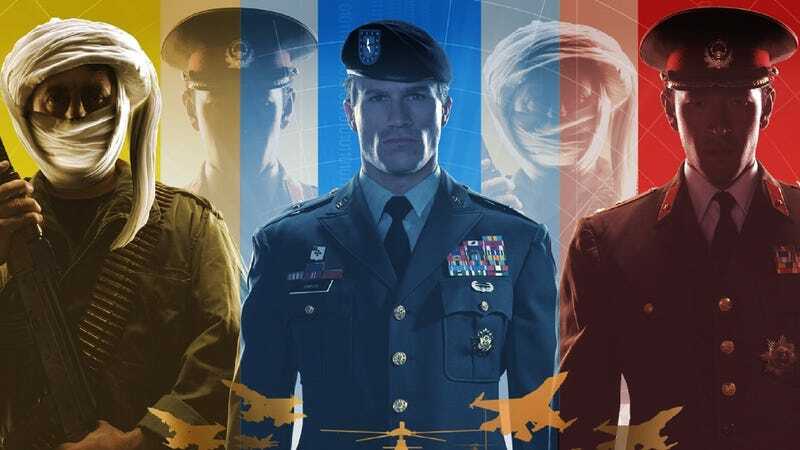 No longer will Command and Conquer's militant "Global Liberation Army" feature generals of obvious Middle Eastern descent, once the game goes free-to-play. Polygon reports that Victory Games made the decision because some folks didn't like the implication that Middle Easterners were a bunch of militant terrorists. "Anyone who knows this series will know the Global Liberation Army," Tim Morten told Polygon. "But at the studio we had a bad reaction from people saying it was pretty offensive to have Middle Eastern characters as militants." The GLA will now have five generals of varying ethnic backgrounds. In video gaming, the military genre has faced an increasingly delicate task of choosing who to make the bad guy as the settings have become more modern, particularly since this last console generation opened. It's why Nazis have been such reliably safe goons, defeated regimes like Imperial Japan are OK, and historical recreations of battles are fair in the strategy genre. That stuff happened, after all. But I can remember a friend chortling at Konami's Rush'N Attack of 1985 and using it to troll a co-worker of Russian descent; so this particular issue goes back a ways. And though not without exception, the Middle East has been off limits—if not because of the unnecessary controversy of someone calling the game racist, but also because of superpatriots back in America who resent the depiction of current conflicts in an entertainment product. Six Days in Fallujah was quickly canned in 2009 amid such outrage. Medal of Honor's 2010 release raised a ruckus because original plans for multiplayer had you playing as Taliban. The feature was later removed but the stink lingered. Military PXes still refused to sell the game. So games makers, like Command and Conquer's are doing now, have played it mostly safe for the past five or so years. Since Call of Duty turned its attention away from World War II, Russia—whether as terrorists or ultranationalist revolutionaries—have served as the adversaries in four games. Black Ops 2 sent you in pursuit of a Nicaraguan drug lord. The threat in Ghosts, we're told, comes from a coalition of South American nations. Though Call of Duty has been plainly reluctant to go to the Middle East, its competitors from Electronic Arts have not. Battlefield 3 included Iranian foes and an invasion of Tehran. Medal of Honor battled the Taliban and Al Qaeda in Afghanistan, and its sequel had terrorists of Persian or South Asian descent as the foes, culminating in a Bin-Laden-style raid in Pakistan. It was banned in that country, as Battlefield 3 was in Iran. Battlefield 4, notably, will go to China and will offer four multiplayer maps set on the mainland. Among others, SOCOM 4: U.S. Navy SEALs gave you Malaysian revolutionaries as the villains. MAG, being entirely multiplayer, didn't have villains per se but the SVER faction, based in Chechnya, drew its membership from China, plus South Asian and Middle Eastern nations, looking very much the part in a uniform with hoods and masks. When people use the uber-cliché "political correctness," I immediately tune out. It's an ignorant talk-radio insult and I don't have much respect for those who use it in an argument. That said, there is a palpable sensitivity, in video games and films, toward the depiction of nations and factions that are hostile to the United States in real life, and it's because of their ethnicity or religious culture. The almost comical way in which Call of Duty has repeatedly hauled out snarling Russian bad guys as the future threat, over China or anything in the Middle East, underlines this. Infinity Ward acknowledged the series has gone to the well with Russia too much, and had to look elsewhere for Ghosts. So they chose a coalition of oil-rich nations. In South America. But I'm not sure what a games maker would have to gain by insisting on reminding people that there are fanatics in the Middle East who hate America's guts, or that China presents a military and economic threat to the United States. Command and Conquer certainly sees no percentage in it.